It’s all a bit male-author-self-discovery-novel, to be entirely honest. After a couple of decades of dodging the issue with increasingly obvious symptoms, I eventually signed up with a GP who told me a few things I already know (It’s bad to leave 20 years between doctors appointments, and I display signs of depression), and – after a bit of blood work and admin faffery – that I’m type-2 diabetic, my blood sugar is mountainous, and I should get this under control before it very literally actually kills me. (She was nicer than that). The resulting changes come in waves, as administration and postal services cause things to arrive. Prescriptions for pills to lower my blood sugar arrived automatically and – Thanking our better past for the NHS – free, and ramp up to their full dosage over the next month. With that I got a pill management thing, because pre-prep and routine help me actually do things and feel more comfortable with it. Being me, I found a glucose monitor that interfaces with my phone and produces various nerdy graphs I can obsess over, and that arrived this morning, so I can stab myself in a medically approved manner. Over the next week I’ve got appointments to get my feet stabbed to check for nerve damage, referrals for other bits and bobs. It’s also finally kicked me into getting back on the “exercise” bandwagon, and back into watching my calorie intake, which will also help me get my blood sugar under control, rather than the four times “normal” it’s currently hovering below. So I’ve signed up for the slimfast of a new generation, at the moment in the form of Huel, as a meal replacement thing. First results are… not great, to be honest. It’s filling, if a bit chalky to drink. However: If you have any opinions upon this, especially if they involve comparing the thing I am consuming in order to improve my health to vomit or worse, I would appreciate restraint in comments here or elsewhere. So yeah. It’s been something of a week, and to be honest the diagnosis of an incurable medical disorder isn’t the best news I’ve had this year. I’m contemplating getting some huel, so will be interested to hear how you get on. I’ve seen various flavouring suggestions, which might help – throwing in a cup of espresso is a common one. My first data entry job was helping catdad look for trends in his blood sugars. The first computerised tester he had had a proprietary cable and software so everything had to be transcribed by hand into a spreadsheet. One of the big trends for his sugars was hot weather. His diagnosis came the week after Spring Bank Holiday 1996. We were out climbing and he just couldn’t stop drinking. Every year after that his sugars always tracked upward with the hot weather without a change in his diet. I hope things come together quickly for you. 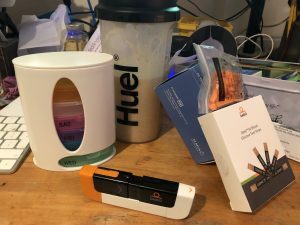 Are “things I have found make Huel more palatable” useful? We’re always behind you Aq. I’m glad this was found before fatality. With Type II, a lot can be done with food control, so that will certainly give you something to track and obsess over – sometimes it’s weird things that cause trouble (or improvement). Once you start checking food labels, you will be first surprised, then annoyed, and then really really angry about how much sugar has been snuck into foods that don’t need any whatsoever. Example: any meats that have been hermetically packaged (common here), can have been soaked in water to increase weight of the food – and the water can have been a sugar solution. I understand some fast food chains’ French fries are blanched in sugar water. And so on – don’t trust anything: read the label. No label? Assume the worst. Huel: my current method of making this drinkable is using the unsweetened variety and then adding monin syrups. These do come in sugar free varieties, although not in the same vast range as the sugar based ones. A healthy dose of hot-chocolate powder is also quite nice.